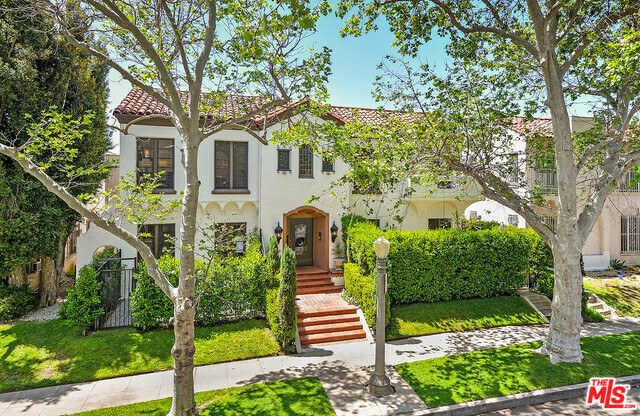 A unit in this rare Mediterranean fourplex condominium a stunning catch in Hancock Park. The exterior is adorned with gorgeous architectural details resembling a Mediterranean villa with arches, grand windows, and tiled roof. Though fully updated with modern luxuries, this property still keeps its original history and charm. The unit is 1,573 square feet and is listed for $1.275 million dollars. The whole condominium unit is secure but convenient with a push button entry system, including a 1 car garage with a remote control. The hallway into the unit welcomes the guests with its double height entryway. The homey living room features a new heated fireplace and opens up to a private gated patio. The patio extends to an elegant dining room and a closet space— you don’t have to worry about storage space! This white luxurious kitchen is fully remodeled glistening carrera countertops, high-end Bertazzoni appliances, and new cabinetry. 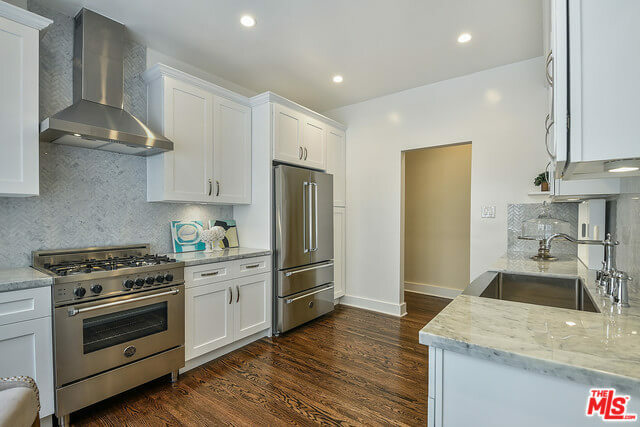 The beautiful backsplash extends all the way up to the ceiling right behind the a chef’s dream stove and range hood, which truly accentuates the deluxe finishing touches on this condo property. There is a separate laundry room with a washer/dryer, sink, built in storage, and a door that leads to the yard. 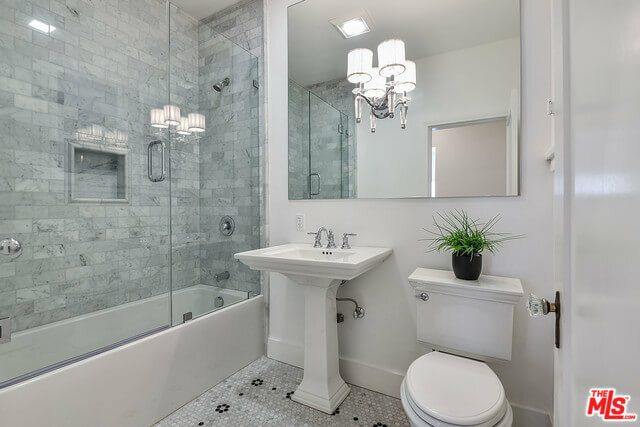 There are 2 bedrooms and 2 bathrooms, which both highlight all new carrera marble bath with soaking tubs. The master bedroom also includes a private side patio and double sink vanities in the bathroom. 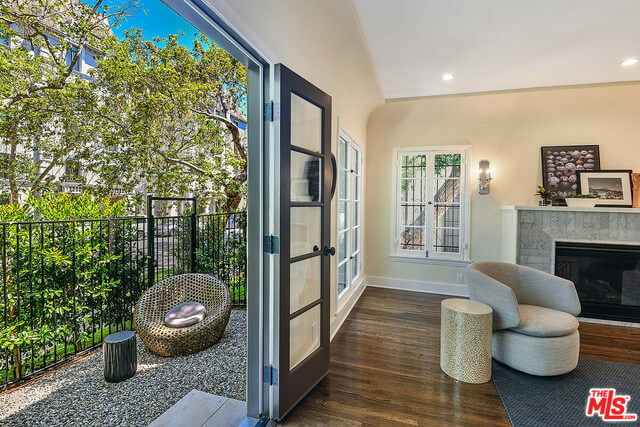 Amidst all the renovations, the charming character features hardwood floors, arches + moldings, crystal door knobs, and original light fixtures, which are unique to this property. The plumbing, AC, and electrical are all brand new. At The Bienstock Group we love what we do, which is selling houses for top top dollar for the owners we represent! We love our clients too!